Locked thread | Replies: 89 (Who? ), Viewed: 93757 times. | Locked by: HystericalParoxysm Reason: New, updated tutorial available. #1 16th Jul 2006 at 10:41 PM Last edited by HystericalParoxysm : 17th Aug 2008 at 11:45 AM. This tutorial is the next step in learning about editing with Unimesh – it will take you through an edit and have you adjust the uvmap to fit your new edit. It also will show you an easy way (in this case) to edit both your fit and fat meshes at the same time. It assumes you have completed the Beginner Unimesh Tutorial. Not every step will have a screenshot, you are expected to draw from the beginner tutorial as needed. Goal – to lengthen the skirt on a teen girl mesh and fix the uvmap to match and make the new texture for it. The purpose is to learn a few more things about editing with Unimesh, small steps at a time. 1) Start Milkshape. Make sure autosmooth is not checked! 2) Import with the Sims2 Unimesh Importer. When it asks, say “YES” to the Create Blend Groups Dialog. That will load both the fit and fat morph for you. If you look carefully, you will also be able to see the 2 meshes are both visible, the trunk will show the 2 sizes, both fit and fat. 5) At this point save your milkshape file to your working folder – naming it tut1.ms3d. That way if your need to start over, you've got this to go back to. We are going to leave both of the groups visible, and select and move both of them together to do this edit. 7) Go to the Model tab and click SELECT, with the setting being VERTEX and ‘IGNORE BACKFACES’ is unchecked. 8) Now select the whole bottom row of the skirt by clicking and dragging across it. Note that you’re grabbing the top of the leg and the underskirt at the same time. This is good. 9) Click on MOVE, and click on the X button so it’s highlighted blue (and the Y and Z buttons should be gray only) and then drag the skirt downwards towards the next row of vertices. 10) Now we could stop here, but I’d like to make the skirt even a bit longer, so click on SELECT again, and drag-select the bottom edge of the skirt and the additional row of leg vertices. 11) Now MOVE (with the same settings) and drag it down just a bit further. Note that you cannot drag this down below the knee area - if you do there will be animation issues, and you'd need to add the vertices for the knee. That will come in a later tutorial. 12) Now ‘save as’ your work, naming it tut2.ms3d. 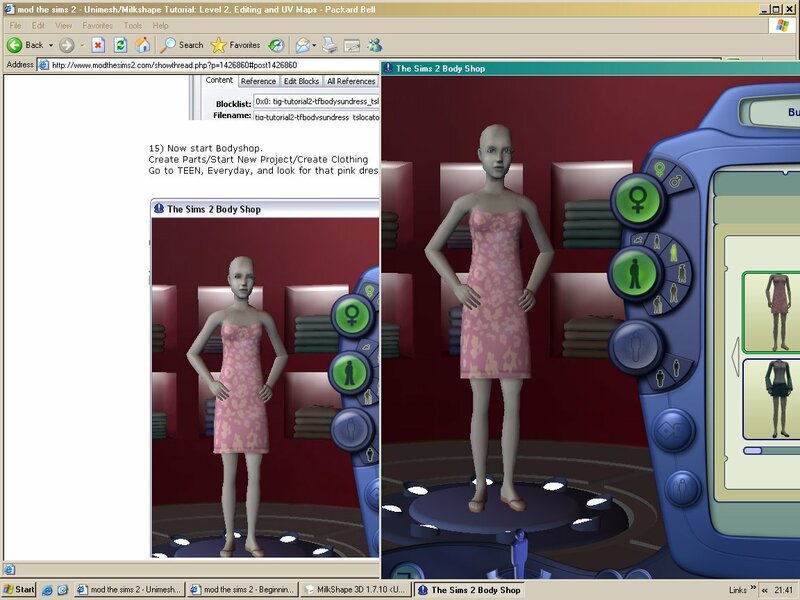 13) Export with the Sims2 Unimesh Exporter – and name the file ‘body1’ and save it to your working project folder. Click ‘Yes’ to the popup that says it’s been changed. Then SAVE your mesh file, and exit SimPE. Now, if you see a longer dress, that’s looking good. With this pattern it’s not hugely obvious, but if you look carefully, you can see that the design is stretched on the lower part of the dress. We’re going to go fix that in a bit. 17) Go back to Milkshape. Now we’re going to flare the dress a bit. Using SELECT, and the 3D window, move your mesh so that you can clearly see the outer lower edge of the skirt. Use ALT-LEFTCLICK to select the first vertice and then SHIFT-ALT-LEFTCLICK to individually select all the rest, until it looks like the picture below. Move you mesh around a bit to make sure you’ve selected all the correct vertices. 18) Now use SCALE to give the dress a bit of flare – type 1.1 into the X and Z values, and then hit the ‘scale’ button next to them TWO TIMES to flare the skirt outwards. Go to TEEN, Everyday, and look for that pink dress again. This time when you click on it, the mannequin should show a nice flared skirt. You need to make sure the mesh is good in the game, and that the morph data was not damaged during the edits. Fire up your game. 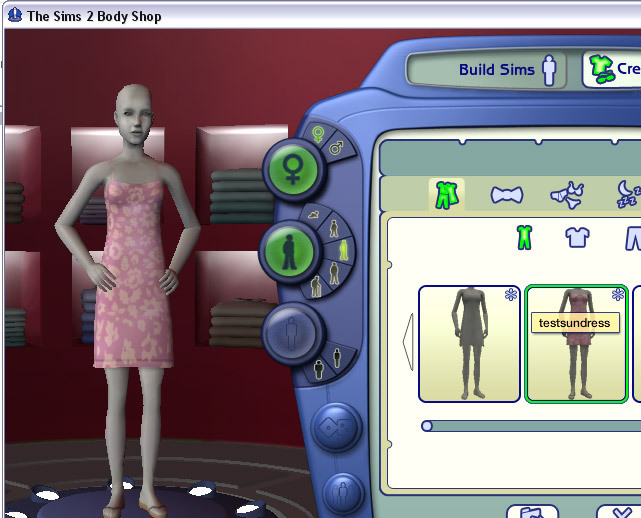 Go to Create a Sim, and make a new sim. Examine her closely, spin her around, and make sure everything looks good. Watch her as she animates. Double check that the fit/fat morph still works correctly (it's at the bottom of button 1). If the fat morph explodes, then you will need to start over (at Part 2 or Part 3) - or use another method I will describe in a future InfoCenter article, I'll link when it's there. Test further in game - have the sim sit in a chair, sit on a couch (they sit different on both of them), dance, and jump up and down on a couch or bed. 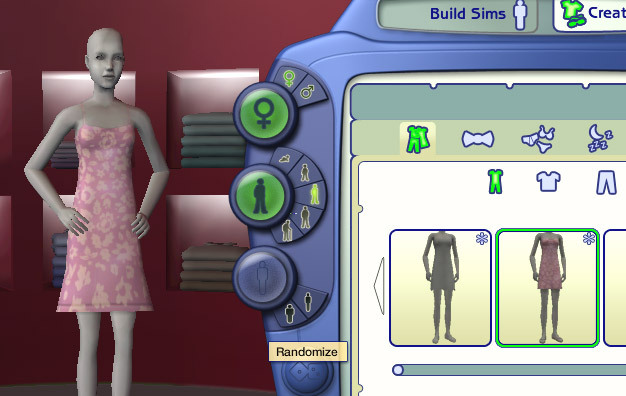 Pause the game and then examine your sim from various angles, and make sure things look reasonable. This particular edit as described should NOT cause any animation oddities. #2 17th Jul 2006 at 3:14 AM Last edited by tiggerypum : 9th Oct 2006 at 1:17 AM. Back to Milkshape, maybe just one last time. Now it’s time to fix the uvmapping. 24) First, let's hide the morphmod, because the morph uses the uvmap from the unmorphed version of the mesh. Go to Groups, select the morphmod, and click the HIDE button. 25) Now click on ‘body’ and the the SELECT button, which will select the entire part of that mesh. Click the MATERIALS tab, and click on the NEW button. 28) The sphere will get the blue check pattern all over it. Now click on the ASSIGN button. 30) Tilt the mesh so that you can see both the lower skirt and the upper legs. You can see the upper legs are a bit compressed, and that the skirt is stretched vertically. 32) A window will pop up. Arrange the windows so that you can see the 3D area of your mesh and the Texture Coordinate Window. 33) The Texture Coordinate Window will probably be gray, showing the morphmod. Select ‘body’ and you should see the blue pattern and the uvmap. If you don’t, close the Texture Coordinate Window, and use the menu EDIT/SELECT ALL and then bring up the Texture Coordinate Window using menu WINDOW/TEXTURE COORDINATE EDITOR. 34) Okay, now it’s time to make adjustments – but right now you can’t see enough of our mesh to easily work with it… so type in ‘.5’ and hit the ‘scale’ button. Also make sure 'Redraw' is checked, so that the changes will show up as you make them. 35) There, that’s much better. Now click on ‘SELECT’ and click on some blank spot, which will deselect everything (turning the vertices and lines white). Now click and drag around the bottom skirt edge (much like what your did when you first started this edit.) Select both the upper leg and the lower skirt edge, being careful not to get the hands. Select both the front AND back at the same time, so that they will remain aligned when moved. 37) Look at your 3D window (and if you had refresh checked) you can see the pattern changing on the skirt. You can also see that the leg boxes are now stretched and need a bit more adjusting. That’s because when we did the original edit, we also moved that row down a bit. So now click SELECT and select the lower skirt and that additional leg row. Be sure to get the front AND back. 38) Now click MOVE and slide it down a little bit more, until the leg looks a bit more even. It doesn’t have to be perfect, but the better you get this, the better your sim will look in game, and the more options (like patterned tights) the mesh will support. 40) Close the Texture Coordinate Window. 41) Now 'Save As' again as tut4.ms3d. This time when you click on it, the mannequin is going to look messed up! Well actually, this is progress. You can see that the design is no longer stretched, but the legs (and shadow) are up on the skirt hem now. That’s because you changed the uvmap and the graphic is NOT changed to match yet. Now you need to do a bit of editing and make a NEW texture and NEW alpha that will look correct for this new mesh. We all use our own graphics editors, so I can’t take you step by step through this – but what you need to do is make the graphic match the uvmap you grabbed. I’m going to describe the procedure for this without too many screenshots. 46) First take the uvmap graphic, and trim away the junk around it so that it’s 512x512 pixels. But if you remember, we’d scaled down the display to half size to make it fit the screen. So you need to scale up your UVMAP – take your 512x512 graphic and scale it 200% so that it’s 1024x1024. Save it. Load in the alpha file, and then paste the uvmap graphic over it on a new layer. You can set the uvmap layer to have very low transparency, and then recolor the alpha layer so that all of the skirt area is solid white, and the legs are solid black. Hide the uvmap layer and save your new alpha bmp. Unimesh doesn't support bumpmaps - so simply make this graphic one solid gray color. 50) Save all 3 new files to Projects/teennew. Then click on the refresh (round arrow) in BodyShop to see your new dress. Put a good descriptive name into the text box. Okay, you're almost done. One last time, fire up your game. 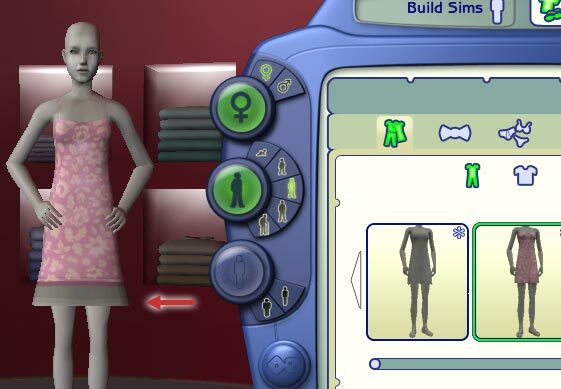 Put the dress on a sim, and have the sim dance, jump on a couch, and so on. Examine it from all angles, and make sure you're happy with the texture, the seam where the top of the leg meets the underside of the dress, and so on. If not, quit and go adjust things further with bodyshop and import another version of the dress. 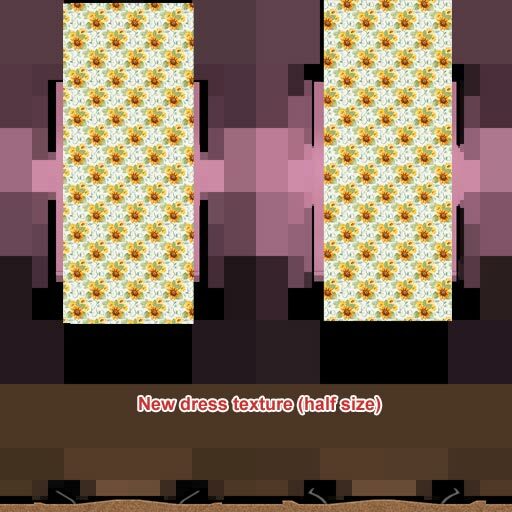 Clean up: while you're in the game, go ahead and DELETE the original recolor - you know, the one with the hem that now has the legs showing on it. Also, once you're out, you can delete the folders you created from your PROJECTS folder. To share our work you will need to give people the file from your SAVED SIMS folder and your mesh file (which I suggest you put in DOWNLOADS). Well, with the amount I lowered the upper leg, the leg develops a slight bulge in it (which shows more distinctly if one lowers the leg even more than I did). So... while we're done learning about uv mapping, you can and should (if it shows on your mesh) adjust the legs on the mesh so that it's a bit narrower there. You would use the same technique to fix the leg as you did in Part 4 to widen the bottom of the skirt. Select one ring of vertices on ONE leg. Use SCALE with 'center of mass' and values of .99 for the X and Z values. Then click the scale button. Repeat if necessary. Select the ring up under the skirt and you can do the same. Then repeat for the other leg. If the values of .99 make the leg come in too much, try .995 instead. You can raise or lower a skirt (or pant leg, or sleeve end) using this exact method, and then adjusting the uvmap. Make sure when you select the parts to move, that you include the top row of the limb (to stretch longer or shorter). Your mesh should NEVER show any gaps after you have edited, if there are gaps, there will be gaps in the game, too! Btw, there are other tutorials about uvmapping in the tutorial area, if you want to see different examples of uvmaps being adjusted or made. Was this tutorial helpful? Scroll back up to the bottom of the first message, and clicky that 'thanks' button. Wow! Thank you. After finishing the first tutorial, this is exaclty what I was looking for to advance my infant meshing skills. A quick glance shows me why I spectactularly crashed body shop when,full of false confidence ,I tried some of this type of editing after my success at taking the ornament off of the dress. Hello Tiggerypum, I've been with this site since Oct of 2004 and this makes my 3rd post here. Kind of a quiet type. First I'd like to compliment you on your tutorial... I make a rather lucrative living educating companies on how to properly train employees to be fast, efficient, and effective so that their turnover rates will be much decreased. Your tutorials are perfect examples of these principles. Now I have a question I'm hoping you can answer for me; How does one properly add an object to an already existing mesh and make it link with the bone structure for animation continuity? I've already used your tutorial to get the clothing article to where I desire it and now I have need to add some extras... a seperate train for a dress to be exact along with a veil. Do you maybe have this answer or can you point me to a further tutorial in which I'd be able to learn these processes? If you want your mesh to have 2 parts (one of which can alpha to transparent instead of skin) start with the hula mesh. Then read in whatever mesh(es) you've been working on. In the end, you need to have the exact same groups with the exact same comments. So, say you want the body to be the long dress, you copy the comments from the hula body and replace the comments on the long dress group with it. Then you delete the hula's body and move the long dress's body up to replace it (it will already be named body so you don't have to rename it). Then you replace the skirt section with your veil mesh... copying comments and renaming it to match, etc. Thank you so much. Asking the right question is not nearly as important as asking the right person. I look forward to your next tutorial. Acorar, I think that would fall under a similar heading as my own question did above. Try the link Tiggerypum supplied to me and you should find your answers there. As for adding boxes and such in Milkshape they are the buttons on the right hand side of the screen under the model tab. Hi, I don't know if this is the right place to ask questions but I was trying to follow this tutorial and I get the point where I should see a longer dress in bodyshop, before the "flare" stage. I cannot see a longer dress and I am unsure if I have done this right. Also do I follow the package tutorial in the basic meshing tutorial from start to finish? Elise, the part that I 'summarize' in the beginning is steps 1-28 (parts I-IV) of the first tutorial. So yes, you have to make the mesh, fix integrity, save out the modified shape and cres, and do the 'package' thing to put them into your recolor so that the recolor points at the new mesh. Also when you are looking for the new dress, don't load your saved project, make sure you do a 'new' project and go looking for it that way. And if you followed this carefully, it's a TEEN dress, so make sure to look in the teen clothing. Thank you so much for this tutorial! When I started out, I didn't even know what a UV map was, and now I actually know what I'm doing! (Or at least I like to believe I do. ;-)) You are absolutely, incredibly awesome, you know that, right? i'm looking at it but there's something weird with the mesh did i lower it too much? Thanks so much for these tutorials, I did a lap of honour after completing beginner tutorial number one. (My family think I am nuts). I have one small problem with beginner tutorial number two. I am having the same problem as Play Girl. I have followed this tutorial twice now all the way through, and I got the same problem each time. I have now attempted this tutorial a third time. I have somewhat succeeded. I noticed when I got to part 3, step 7, I didn't have 'Redraw All Viewports' checked. Making sure I had this checked before moving the vertices, I watched the 3D model while moving the selection, and stopped when the leg started to bulge. I have attatched another screenshot comparing my effort in Body Shop with the tutorial picture, pretty close. I should learn to pay more attention. This message has been deleted by t2suggas. #15 9th Oct 2006 at 12:48 AM Last edited by tiggerypum : 9th Oct 2006 at 4:21 AM. Also, the 'underneath center' of the dress where the leg comes out should be tucked a little bit up under the dress, it should be a little bit above the hem. So playgirl, the odd shape you saw on the mesh probably came in some way from you moving the leg downward. I am going to postpone carrying on with this tutorial. I am going back to number one. I would like to be able to carry out all the SimPE steps without having to consult the tutorial. I am not confident enough yet in my own abilities with that. I am going to attempt to remove all sorts of ribbons and bows from other meshes, before moving on. So watch out for replies in that tutorial thread for my attempts. These tutorials are fantastic, and I would recommend them to anyone wishing to explore this aspect of creating. 2) are you accidentally replacing the gmnd instead of gmdc? That makes a mess of things. If it looks like you did that at any point, you'll have to remake your mesh file, fix integrity, and attach it to a recolor again. #19 28th Oct 2006 at 2:48 AM Last edited by Ngelicdark : 28th Oct 2006 at 3:01 AM. I'm pretty sure I didn't have problems with unimesh since there were no errors with it when I exported. However, I'll try to remake the mesh, although I'm pretty sure that I did replace the gmdc. #21 3rd Nov 2006 at 2:38 PM Last edited by Mirmana : 14th Nov 2006 at 12:06 PM. I don't understand this part, when I click on the link I see nothing like checkpattern.bmp... I don't know where to get it! See the 'you will need' section at the beginning of the tutorial. Follow the link there and at the end of the first message, there are patterns for uvmaps, that's what you'd click and unzip and put someplace where you can find them. That was a really great tutorial! Thank you for the help! You are a great help. Thank you so much for this tutorial. I make some new mesh, but I have a question. I don't see bump map .... why? I'm searching in the forum from a lot of time, but I haven't find a solution. Read (and write) in english is hard for me, sorry for this. I hope you can help me.